A big THANK YOU to all who came out to our show on October 27th. We had a great time performing with the Berkshire Hillsmen! Check out some photos of both choruses at the event, courtesy of photographer and chorus member Tamara Hitchcock! 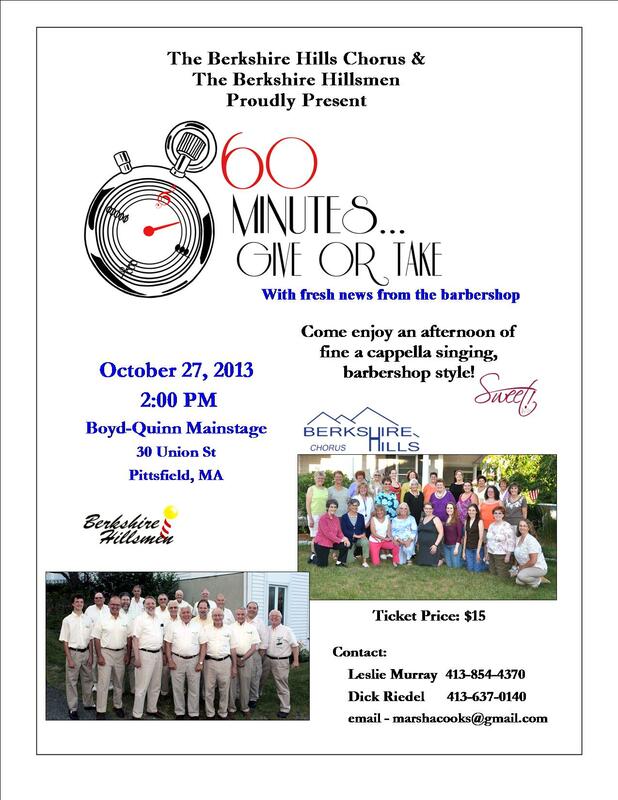 We are so happy to again be working with the Berkshire Hillsmen to produce another awesome barbershop show on the Boyd-Quinson Mainstage Theatre, 30 Union Street in Pittsfield! Please contact any of our members for details or to buy tickets. The cost of the ticket helps keep our choruses running so that we can continue to put on shows and sing in the community. We are also selling advertisements for our show program. Please contact us if you are interested in being a supporter of our show by purchasing an ad. Previous Post Check us out in the Berkshire Eagle! Next Post Holiday singouts are coming!